If you're interested in getting a jump start on Halloween costumes this year, and want some unique and handmade costumes, check out Soul Role. 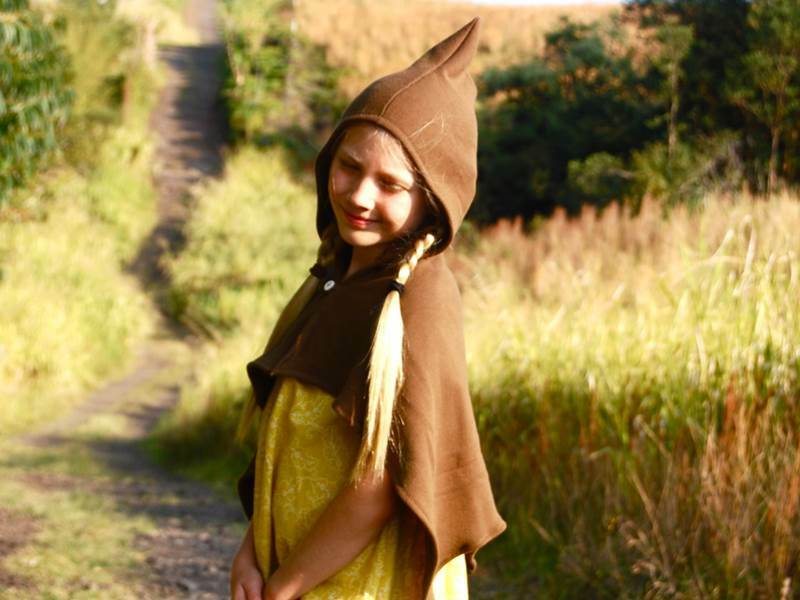 Soul Role makes some really cute and affordable eco-minded Halloween costumes, like the adorable Pixie Cape shown above and Halloween accessories, not to mention plenty of other nice clothing for kids and adults. Most of the costumes shown below would go great with other Halloween accessories and mix and match too. Turn around time for this Etsy shop is about 14-20 days (not including shipping time) for all made to order items, so if you see a Halloween costume below that your little one would adore, order soon so you can get your costume in time for Halloween. 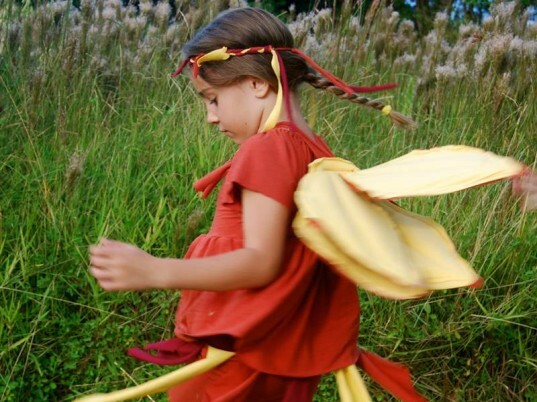 Many kids love dressing up as a fairy for Halloween and these wings are super sweet. These wings are made with two layers of eco felt, made from 100% recycled PET plastic bottles and padded on the inside with a layer of 100% organic cotton batting. The outer layer of organic cotton/soy/spandex jersey comes in pretty autumn colors that match the season and Halloween. Bonus, these wings don’t allow any wire to poke your little one, so they’re ultra comfortable and safe too. Need a skirt to go with the wings above? This petal inspired fairy skirt is made with reused/recycled fabric from other Soul Role projects and made to fit a wide age range for years of imaginative play. There’s a comfy fabric waistband to keep the skirt in place and a slight a line shape and raw hem gives the skirt a natural, very fairy look. The skirt is made with organic cotton/soy/spandex jersey and comes with a cute fairy headband (shown in fairy wings picture). Currently Soul Role is offering this skirt in a slew of colors, including rust, fir green, chocolate, ocean, gray, plum, navy, ruby, stone blue, vanilla and more. No matter if your little one wants to be a pirate or superhero this Halloween, this cape will work out great. Made with silky hemp/silk charmeuse, this cape is eco-minded and shiny. It has a hook and eye closure which is very securely attached plus some fancy buttons sewn on for extra decoration. Soul Role will also make this with a velcro closure or snap closure if you like. 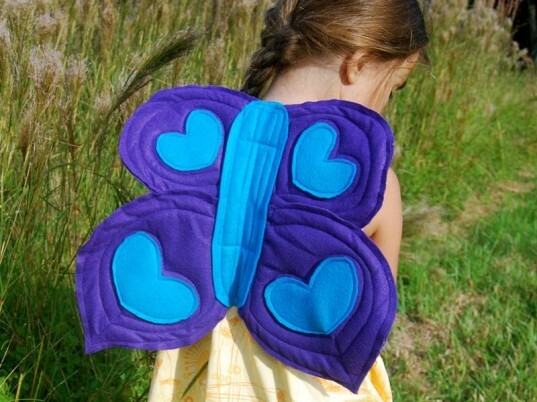 How cute are these padded butterfly wings for Halloween or even everyday dress up fun!? They could also be used for a cute fairy costume too. The wings are made with 100% recycled PET plastic bottle eco-felt and padded on the inside with a layer of 100% organic cotton batting. Each wing is carefully hand stitched together and comes complete with a contrasting colored fabric heart. The wings straps are made out of left over pieces of organic cotton/soy/spandex jersey and each set of wings can be made in custom colors of your choice such as purple, turquoise, pale pink, or green. This oh so cute Halloween hat in a friendly Brown Bear style is made with organic cotton hemp fleece that’s extra cozy. The fleecy side of the fabric lines the inside of the hat and scarf for added warmth plus the front of the ears as well for an authentic bear look. This is made to fit most 2-5 year old children, but if you’ve got a whole family of bears in mind for Halloween, Soul Role also makes adult versions of this hat. This adorable Little Red Riding Hood red cape features a slightly over-sized hood attached to a gathered cape. There are braided ties sewn securely into the seam that are extra easy for little hands to tie in case they come undone. The cape is made with an organic cotton/soy/spandex jersey fabric that’s cozy and soft and easy to care for. 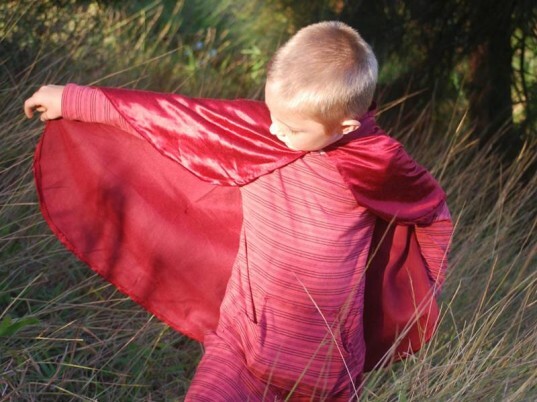 If ruby red isn’t quite your child’s fave color, this cape can also be made in pumpkin, stone blue, ocean, navy, plum, chocolate, fir green, black, vanilla or gray. Many kids love dressing up as a fairy for Halloween and these wings are super sweet. These fairy wings are made with two layers of eco felt, made from 100% recycled PET plastic bottles and padded on the inside with a layer of 100% organic cotton batting. The outer layer of organic cotton/soy/spandex jersey comes in pretty autumn colors that match the season and Halloween. Bonus, these wings don't allow any wire to poke your little one, so they're ultra comfortable and safe too. Need a skirt to go with the wings above? 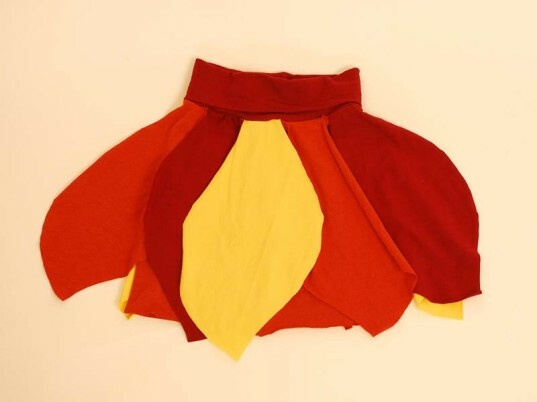 This petal inspired fairy skirt is made with reused/ recycled fabric from other Soul Role projects and made to fit a wide age range for years of imaginative play. There's a comfy fabric waistband to keep the skirt in place and the slight a line shape and raw hem gives the skirt a natural, very fairy look. The skirt is made with organic cotton/soy/spandex jersey and comes with a cute fairy headband (shown in fairy wings picture). Currently Soul Role is offering this skirt in a slew of colors, including rust, fir green, chocolate, ocean, gray, plum, navy, ruby, stone blue, vanilla and more. 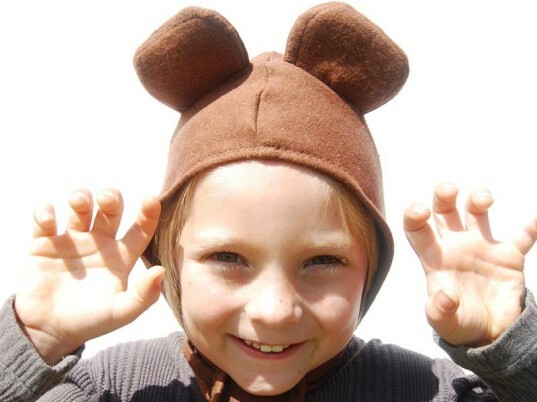 This oh so cute Halloween hat in a friendly Brown Bear style is made with organic cotton hemp fleece that's extra cozy. The fleecy side of the fabric lines the inside of the hat and scarf for added warmth plus the front of the ears as well for an authentic bear look. This is made to fit most 2-5 year old children, but if you've got a whole family of bears in mind for Halloween, Soul Role also makes adult versions of this hat. 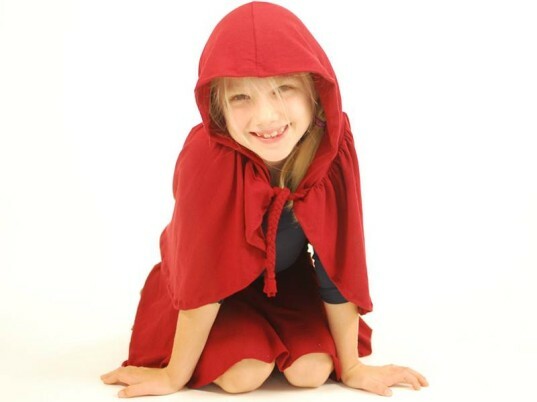 This adorable Little Red Riding Hood red cape features a slightly over-sized hood attached to a gathered cape. There are braided ties sewn securely into the seam that are extra easy for little hands to tie in case they come undone. The cape is made with an organic cotton/soy/spandex jersey fabric that's cozy and soft and easy to care for. If ruby red isn't quite your child's fave color, this cape can also be made in pumpkin, stone blue, ocean, navy, plum, chocolate, fir green, black, vanilla or gray.